After what seems like a never ending, New England-esque winter, with snow days and hot pops galore, our favorite season is quickly approaching. No, I’m not talking about the cherry blossom festival (though beautiful), or that magical week when my friend’s rooftop pool opens. I’m not even talking about those perfect spring days when the best way to walk home is with a strawberry-ginger-lemonade pop in hand. I’m talking about wedding season. It’s here, and I’ve got many dresses waiting to debut. As a fun, delicious, and totally customizable dessert caterer, Pleasant Pops has helped facilitate over 200 weddings and events in the past few years. 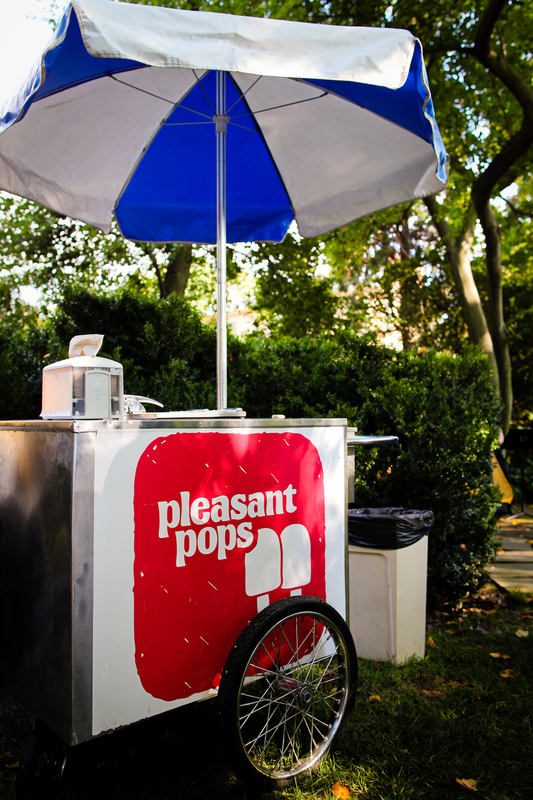 Predating our existence as a cafe in Adam’s Morgan, Pleasant Pops began catering events in 2011 serving pops out of coolers, our vintage pop cart and eventually even using our truck, Big Poppa. We’ve parked outside of downtown DC bars for mid-reception snacks, been stationed inside a barn in rural Virginia for a rustic fall celebration, and even visited a DC rooftop for a sunset ceremony. With dozens of pop flavors to choose from, we’re happy to include specific flavors to make your day special (think signature cocktails, but frozen, kid friendly and great looking in a picture). For more information, visit our catering page where you have the option to choose flavors (Seasonal Favorites, Kid Friendly or Non-Dairy), method of delivery (either in-store pick-up, delivery or full-on staffed catering) and can learn more regarding price estimates. We’re happy to be in touch via email as well for more specific inquiries. If you just can’t imagine celebrating that special day without a Guac pop in one hand and your partner’s hand in your other, be sure to get in touch today! !